As the hardreading staff has noted, smaller-all-the-time radio personality Howie Carr has been a dedicated Trumpkin from the very start. Later, there was this fanboy wet kiss in Carr’s Boston Herald column. PALM BEACH, Fla. — So here was President-elect Donald Trump, in a tuxedo, talking to 800 or so formally dressed guests in the ballroom at his Mar-a-Lago Club here on New Year’s Eve. Of which Howie Carr is now one, according to Politico Playbook. — MORE NEW MAR-A-LAGO MEMBERS: Daniel Bouaziz and Sophia Baratashvili, Howie and Kathy Carr, Gil Cohen and Paul Gervais, Jean Doyen De Montaillou and Michael Kovner, Robert and Susan Falk, Diane Lokey Farb, Carol . . .
1) Did Carr get the Coat Holder Discount for the newly calibrated $200,000 Mar-a-Lago membership fee? 2) Which local daily will be the first to pick up on Carr’s quantum leap in social status? Did Howie Carr Get a Head Transplant? Boston Herald huckster Howie Carr can often be seen in the pluggy local tabloid hawking one thing and another other than his column. But check out Donald Trump’s #1 coat holder (latest mash note here) in this ad today. Is it just us, or does that not even look like the same person? The hardreading staff normally likes to ignore Boston Herald columnist Howie Carr(toon), but every now and again we just can’t help ourselves. 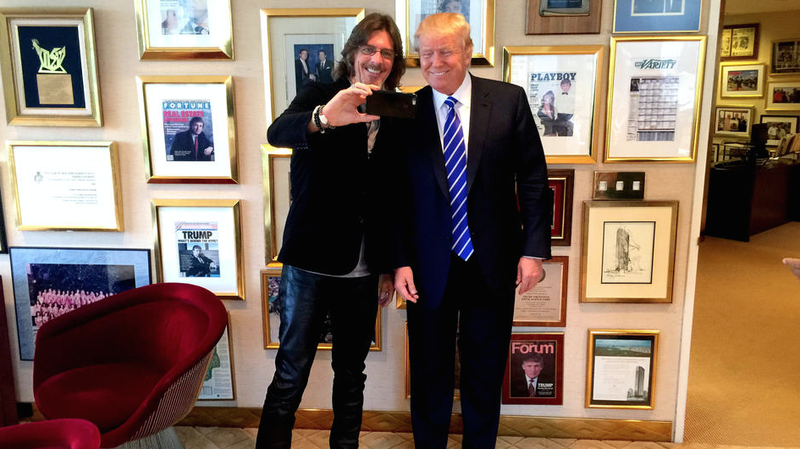 Herald Track Gal Gayle Fee has this update today on that fundraiser the autoheirotic Ernie Boch Jr. is throwing at his $30 million Norwood manse for Donald Trump. Car czar Ernie Boch Jr. said the guest list for his Aug. 28 private fundraiser for Donald Trump now tops 700 and his office has fielded hundreds of calls from fans of the White House wannabe who want in. Boch said he’s even heard from a handful of Democratic officials who want to come to the event but who can’t, for obvious reasons, write a check to the GOP presidential hopeful. “That’s why were doing cash or check at the door,” he said. Carr’s presence in helping raise money for the bloated billionaire makes perfect sense since he’s a total Trump groupie, with today’s column Exhibit Umpteen. Of course, Carr long ago surrendered his press credentials in favor of GOP fundraising, as the redoubtable Dan Kennedy has noted several times. File under: Keep on spinnin’. The hardreading staff has a serious beef with the Boston Globe’s Names column, as we noted in a recent post. Conservative talk-show host Howie Carr fancies himself a man of the people, albeit one who went to an exclusive prep school (Deefield Academy), attended a fine liberal arts college (University of North Carolina), and resides in a wealthy Boston enclave (Wellesley). So it should be no surprise that, like any other average Joe, Carr has become a newly-minted member of the Mar-a-Lago Club, President Trump’s posh Palm Beach, Fla., retreat. That, not surprisingly, went over like the metric system here at the Global Worldwide Headquarters. But, hey, that’s show biz. Then again . . . we did seem to tap into some basic sense of decency in the Namesniks, as yesterday’s column featured something new (at least as far as we can tell) – honest to God attribution. Of course, that does nothing for the hardbleeding staff. But we’re happy to take one for the team. Is Adriana ‘Cohen Away’ from the Boston Herald? Sharp-eyed readers of the feisty local tabloid might have noticed a few changes this week at Boston Herald Radio. First, though, here’s what the lineup looked like as recently as last Friday. The change that jumped out at the hardreading staff was the shifting of Herald columnist Adriana Cohen from the daily 6 to 9 morning slot to an hourlong Wednesday gig at noon. As Ernie Boch Jr. might say, step on down! But the more we thought about it, the more we started to wonder if this might be a transitional move while Cohen waits for a spot in the Trump administration. But that kind of smashmouth politics is just what Trump tends to reward, so don’t be surprised if Cohen drifts down to D.C. sometime after the first of the year. As the hardreading staff has noted, the Boston Herald has been alarmingly lax lately about holding its crosstown rival to task, both regarding the Boston Globe’s recent home delivery meltdown and last week’s Let’s remake the paper! We can use John Henry’s garage! memo from editor Brian McGrory. But the feisty local tabloid is back on the job today, spurred on by yesterday’s front-page faux pas in the Globe’s Ideas section. Well today’s Herald is on that like Brown on Williamson, giving it classic jump-the-gutter treatment (Inexplicable Little Green Number sold separately). We’ll leave it to you splendid readers to decide whether you want to sample the goods: there’s a media reax piece and a thumbsucker from Jack Encarnacao, while Howie Carr mails in another shopworn litany of Globe mortal sins. At least we know they’re awake on Fargo Street. Finally. The Boston Herald’s normally ignorable columnist Adriana (Trumpless GOP Can Kiss Me Goodbye) Cohen, who is almost as big a Trump Chump as her work husband Howie Carr, caused quite a rumpus on CNN yesterday when she went Chernobyl on Ted Cruziac Amanda Carpenter over his alleged extramarital affairs – including with Carpenter. Second of all, let’s go to the videotape. In today’s Herald, Cohen says . . . nothing. But we have high hopes for tomorrow. You have searched the It's Good to Live in a Two-Daily Town blog archives for ‘Howie Carr Donald Trump’. If you are unable to find anything in these search results, you can try one of these links.